A unique designer of luxury, elegant clothing: Patricia Lester's biography. Patricia Lester (nee Wake) was born in Nairobi, Kenya in 1943. Her father is a Londoner, a direct descendant of Hereward the Wake - the person upon whom the legend of Robin Hood was based. Her mother comes from an old family on Portland Bill. Her father worked for the Colonial Service and became the Chief Customs Officer of Kenya and Uganda, his career was cut short and he had to retire early due to ill health provoked by the tropical heat of Africa. In complete contrast to the colonial life the family moved to Buckinghamshire in England and became poultry farmers while their three children attended school. Patricia was educated at Thornton College, a small private Catholic Convent School for Girls. When she had completed her schooling, Patricia went to the College of Technology in Oxford to study to become a secretary. She then became a secretary in St. Anne's College where she worked for the Principal and tutors such as Iris Murdoch the famous author. Charles and Patricia were married in 1963 and they moved to South Wales where Charles worked and she worked at the chief engineer's secretary at British Steel. Their daughter, Georgina was born in the following year and Patricia decided that she wanted to spend as much time as possible with her child. So in order to supplement their income she decided to try working from home. The opportunities for taking in typing were rare and in desperation she put an advertisement in the local shop window saying that she would take in dressmaking. Although Patricia gave up needlework in school her mother had taught her daughters to sew, knit and crochet. She had done dressmaking when in Oxford and so she thought that this might be the perfect answer to their financial problems. This was a tough apprenticeship, but she learnt to sew reasonably competently teaching herself as required when different problems arose. Even at this early stage she would experiment with different ideas when knitting or sewing, going so far according to the instructions and then changing everything if she thought it might make a more interesting garment. This dressmaking was not a business at this stage, but gradually Patricia started buying fabric and making original garments. She designed a collection for her young daughter, which was so admired by friends that she decided to take a stall in Newport market and sell ready made children's clothes instead of taking in dressmaking. The business was not an overnight success, it took many years of hard and dedicated work, fitted in with the roll of wife and mother. After two years in the market Patricia decided to design and make adult clothes which they sold on a party plan basis. Patricia Lester the fashion designer. At this time the fabric that was available was synthetic and Patricia and Charles wanted to work with their own hand dyed textiles, which is only possible on natural fibres. They experimented with traditional techniques of tie-dye and batik and although these fabrics were interesting, they did not fulfil their desire to have something totally unique. One of their experiments eventually evolved into the pleated silk that became their hallmark. Originally intended as a dying technique - the fabric being pleated, dyed and then ironed out - giving a fascinating tree-bark effect - it seemed a shame to flatten the pleats which had an interesting fluid quality. They had not heard of the artist Fortuny whose pleated work has been compared to theirs - so to them this technique was original and indeed it is nothing like Fortuny's work having a fluidity that is uncharacteristic of the straighter more rigid Fortuny pleating. 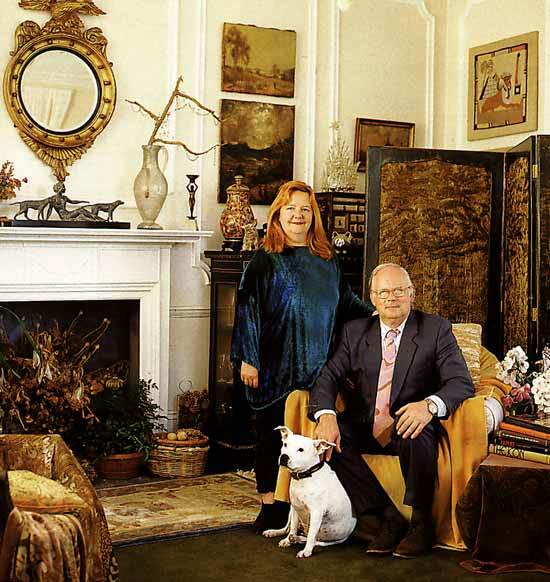 Their first major wholesale client was a small exclusive shop - 'Smiths of Bath' - Harrods of Knightsbridge then bought a collection. At this time the fashion was for dramatic ball gowns and their simple columns of pleated silk were very different from any other designer's work. During an International Silk Convention held in Liberty's in London Patricia was given all the windows of the store in Regent Street. Liberty used these unique clothes as the central focus for each window in an exhibition celebrating the beauty of silk. The windows were a phenomenal success. The couture buyer from Bendels in New York saw the display in Liberty's and invited Patricia and Charles to London to discuss Bendels carrying the collection. Once in New York many other major stores wanted to place orders. By the early eighties the business had become well established and was growing rapidly. It was at this time that Patricia was voted 'Welsh Business Woman of the Year' as well as receiving the award 'Fit for Work', in recognition of her commitment to employing disabled people. Patricia's most significant achievement was to be awarded an M.B.E. (Member of the Order of the British Empire) by the Queen in recognition of her innovative work as a fashion and textile designer. Charles joined Patricia full-time when the business became too much for one person to run. Since then the business has involved work for films, television and opera. Some of the most exotic women in the world choose these interestingly different clothes for both private and public occasions. They have adorned stars at the Oscars and graced Royalty at State banquets - a far removed concept from the simple dressmaking that was just a supplement to their income when they first married. Patricia's interests outside her business include painting and writing. She enjoys gardening and their large garden is a source of relaxation as well as hard work. Both Patricia and Charles are keen members of 'The Folly Fellowship' and have recently constructed a ruined chapel by the side of a major water feature in their garden. They collect stone whenever they see interesting buildings being demolished and plan to use a large amount of Bath stone when redesigning a home that they have in west Wales. The Ryder Cup 2010 is to be held at the Celtic Manor Hotel with its three golf courses is within easy reach of our Abergavenny studios.